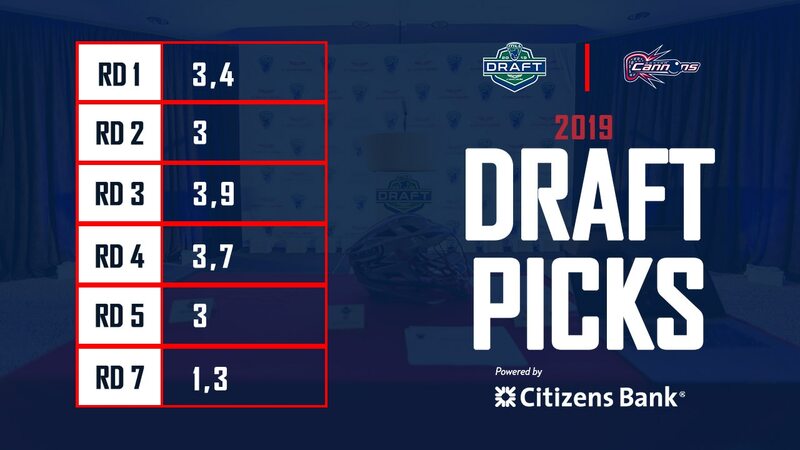 QUINCY, MA - With the 2019 Major League Lacrosse (MLL) Collegiate Draft Presented by Cascade set for this Saturday at the NASCAR Hall of Fame, the Boston Cannons are eager to add a new group of prospects to their roster. And with ten picks, including two in the first round, they will have plenty of opportunities to do so on March 9. The Cannons, like all teams, have pinpointed several college seniors that sit atop their draft board. About 80 players round out the list being broken down by position, need, and best available. These players not only fit specific needs for this year, but for future seasons as well, in some cases. While this list of draft hopefuls is undoubtedly a long one, some players at the top of it include Tate Boyce (Providence), Austin Henningsen (Maryland), John Daniggelis (Yale), and Pat Spencer (Loyola). These four seniors fit some of the needs the Cannons have recognized and will be watched closely leading up to the draft. “Certainly, all those young men are in the mix,” said Quirk. “But as the college season is progressing, I [also] think more and more seniors are emerging. There are some players that were not talked about early on that are really coming along. Those are some guys that we are looking to get. You could almost call them “sleeper picks”. Barring any pre-draft trades, adding ten new players to an already deep roster will give the Cannons plenty of depth—and competition—for training camp come this May. Furthermore, certain holes need to be filled and the Cannons believe they have identified the right players to add to the team. Boyce currently ranks tenth in the NCAA with a .582 save percentage and fifth with a 9.32 goals against average. He was named the Big East Defensive Player of the Week on February 25 after a 27-save performance against Saint Joseph’s, allowing just five goals in the Friars victory. In 53 career games with Providence, Boyce has a 9.42 goals against average and a .545 save percentage. Two years ago, Boyce finished the season sixth in the NCAA in both save percentage and goals against average. He is one of 50 players on the 2019 Tewaaraton Award watch list. After posting just six points in his first two seasons at Yale, Daniggelis saw a big increase in production as a junior in 2018 with 15 goals and six assists. That same year, he helped the Bulldogs win the Ivy League Championship and their second national title. Through three games this season, he has three goals and six ground-balls, but the Cannons have kept their eye on him as the draft approaches. Daniggelis is currently the captain of the Bulldogs. Since breaking into the league during the 2015-2016 school year, Henningsen has won 437 face-offs and tallied 13 points in 56 games for the Terrapins. In six games this season, he has gone 59-33 at the face-off-X and is ranked 11th in the NCAA with a .641 winning percentage. On February 12, he was named the Big Ten Specialist of the Week after going 15-for-15 at the face-off-X against Richmond. Arguably the most sought-after senior in 2019, Spencer is likely going to be picked up early in the draft. In 56 career games at Maryland, he has amassed 117 goals and 186 assists and entered the 2019 season as the Patriot League’s all-time leader in assists. Through four games this season, Spencer has 17 goals and 20 assists and is tied for first in the nation with a 7.40 points per game average. Additionally, he is tied for second in assists per game with a 4.00 rating. Spencer should add a strong scoring punch to any team’s attack unit. He was also named to the 2019 Tewaaraton Award watch list. You can watch the 2019 MLL Draft LIVE on Lax Sports Network online or on their LSN App. Coverage begins at 7:00 PM EST.